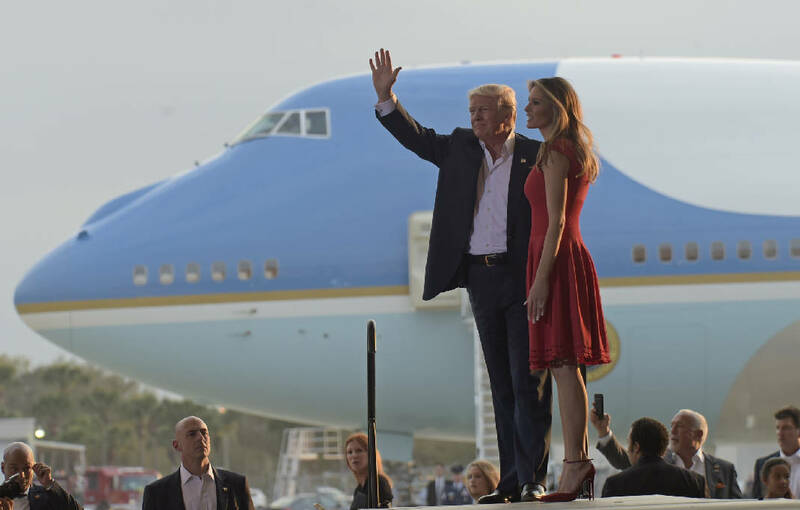 WEST PALM BEACH, Fla. (AP) - One day after delighting in a massive campaign-style rally, President Donald Trump is turning back to the business of governing. Trump, who is spending the weekend at his private club in Florida, plans to spend Sunday interviewing at least four candidates to be his new national security adviser. The meetings come as he seeks to refocus his struggling administration after weeks of tumult. Speaking to reporters on Air Force One Saturday, Trump said he had "many, many that want the job." He also hinted he had a favorite. "I've been thinking about someone for the last three or four days, we'll see what happens," Trump said. "I'm meeting with that person. They're all good, they're all great people." Scheduled to discuss the job with the president at Mar-a-Lago were his acting adviser, retired Army Lt. Gen. Keith Kellogg; John Bolton, a former U.S. ambassador to the United Nations; Army Lt. Gen. H.R. McMaster; and the superintendent of the U.S. Military Academy at West Point, Lt. Gen. Robert Caslen. White House spokesman Sean Spicer said there could be more meetings for the job, which is unexpectedly open after retired Gen. Michael Flynn's firing early this week. Also on Trump's schedule Sunday: phone conversations with several foreign leaders Sunday and a health care policy meeting. But for a moment on Saturday, Trump went back into campaign mode with a massive rally before thousands of supporters at an airplane hangar in Melbourne, Florida where he revived campaign promises to build a border wall along the U.S.-Mexico border, reduce regulations and create jobs - and continued his attacks on the media. Trump told the cheering crowd that he wanted "to speak to you without the filter of the fake news." Trump promised anew to build a border wall along the U.S.-Mexico border, reduce regulations and create jobs. He also pledged to "do something over the next couple of days" to address the immigration order that has been blocked in the courts. Said Trump: "We don't give up, we never give up." Insisting he was the victim of false reporting, Trump said his White House was running "so smoothly" and that he "inherited one big mess." The president has been trying turn the page after reports of disarray and dysfunction within his administration. The rally was put on by Trump's campaign, not the White House. Trump told reporters he was holding a campaign rally because "life is a campaign." And the president's supporters welcomed the opportunity to see him. Kenneth Wood, a 45-year-old electrical engineer from Daytona Beach, said this is his fourth or fifth Trump rally. "His bond with his supporters is really like nothing I've ever seen," said Wood. "They're fun and Trump's a hell of a showman." Asked about Trump's recent comments about the media, Wood said: "I can't say I completely disagree." The rally came during Trump's third straight weekend at his private south Florida club, Mar-a-Lago. Flynn's departure was another blow. Flynn resigned at Trump's request Monday after revelations that he misled Vice President Mike Pence about discussing sanctions with Russia's ambassador to the U.S. during the transition. Trump said in a news conference Thursday that he was disappointed by how Flynn had treated Pence, but did not believe Flynn had done anything wrong by having the conversations. Trump's first choice to replace Flynn, retired Vice Adm. Robert Harward, turned down the offer. Associated Press writer Tamara Lush contributed to this report from Melbourne, Fla.